First of all, I would like to apologize that I can't provide any videos or images for now to support my claims. This is due to the fact that I don't own another camera and that I gave my previous phone to my sister that's why I don't have any means to capture things that I do on the N8 itself. Can someone please give me a device to take picture or record my N8 experience ? 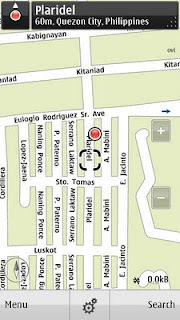 Ok, so I have tested the Ovi maps application that comes default on the nokia n8. Its a great application, it works the way it supposed to work (help in navigation). GPS initial lockdown is faster (around 1-2 mins) than what I experienced with N97 and E71 (ranging from 3-10 mins). Overall, its working good. Then I saw an update on betalabs about the new Ovi maps version v3.06, I quicly headed to the website and downloaded the application update. 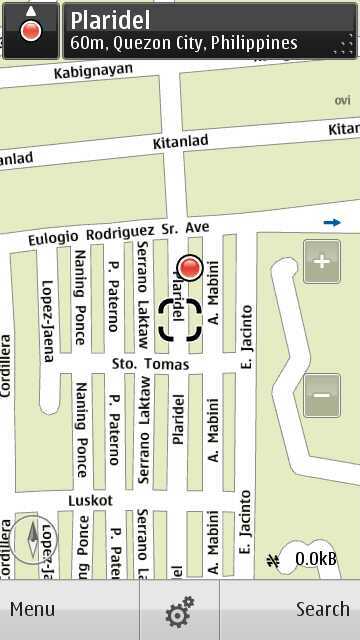 This is one of the major improvements done on the new maps version. It becomes really really easier to navigate on the maps because of this update. The pinch to zoom and panning is so smooth. I'm really amazed by how the response of the maps to touch gesture is so fast. Its even better than the Menu navigation of S^3 itself, and of course way way better than the default S^3 browser. Now If they can make this improvement on touch responsiveness to maps, I bet they can do that to device wide. I'm getting excited on the fact that this kind of experience could be implemented on the new browser. New maps with public transport lines (as a new map layer) for subways, trams and trains in 80+ cities around the world. Just click the map toolbox icon and select Transit lines. I noticed this one too, MRT is marked as a transit line along edsa. Improved search experience - find places and addresses around you - or anywhere in the world - fast and easily. Browse places or enter a keyword in the search box. Now with suggestions and "did you mean?" functionality. I don't agree yet. If you're not online (connected to grps/3g/wifi), you can't search for places effectively. Plus I'm not seeing any suggestions. New place pages with description, reviews, pictures and places nearby. Interact with places in a whole new way - you can check in, contact, navigate, save, rate, share, report or see place on the map. Check In works similarly with foursquare. It's integrated to social network app that comes by default to Nokia N8. Social network app includes twitter and facebook client for S^3 phones. They're both integrated with check in , when you update wall post on facebook, you can opt to include your current location by just tapping the "share location" (ovi automatically selects the place you are currently in based on GPS data) button below status updates. Share a place - send a place to your friends via SMS or Email. The SMS contains the address and a link to the place page with description, ratings, contact, URL and a mini map. The link opens up on the mobile browser (also on non-Nokia devices). New Drive assistance mode with live traffic flow - after clicking Drive, you're instantly in drive assistance mode with live traffic flow and more. Once you start moving, get safety camera alerts and speed limit warnings. More folder with many rich content services relevant to your location. Personalise your Ovi Maps by selecting the services you'd like to keep on your main menu for instant access. This is more on personalization, I've kept mine on default settings since the only thing I used on ovi maps is Check in, My Position, Drive, and favorites. Nothing else. 1. GPS lockdown may get disconnected if the car runs inside a tunnel (even a 100 meters long and 4 meters deep tunnel). Encountered in on the tunnel seperating Col. Bonny Serrano ave and C5. 2. Phone sometimes get confused on the actual orientation of the compass. There are times when turning a long right/left curve , the phone thinks that you are facing the other direction. Encountered it on the long bridge along C5 that stretch from the tunnel mentioned above until past Ortigas Ave. Overall, the dashboard's car speed and length of travel is pretty accurate. With variance of 3-5 km/h on vehicle velocity (comparison between car's actual dashboard speedometer reading and N8's ovi maps dashboard reading). GPS positioning is also accurate. Plus the fact that its free (no licenses to buy and no data downloading/data connection required during usage). Totally free, forever. It works well, very simple to use and it's also freeware. Cool, its a great app. I'm also curious if there is something for screen recording. Let me know if u find something.